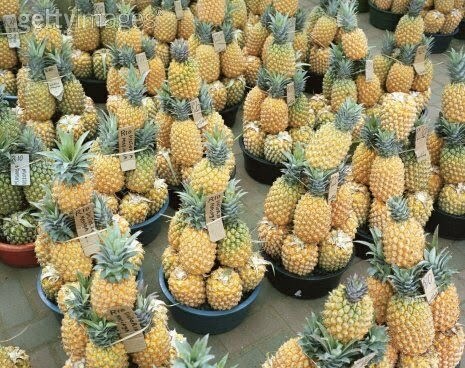 Are DRUGS in your PINEAPPLE? 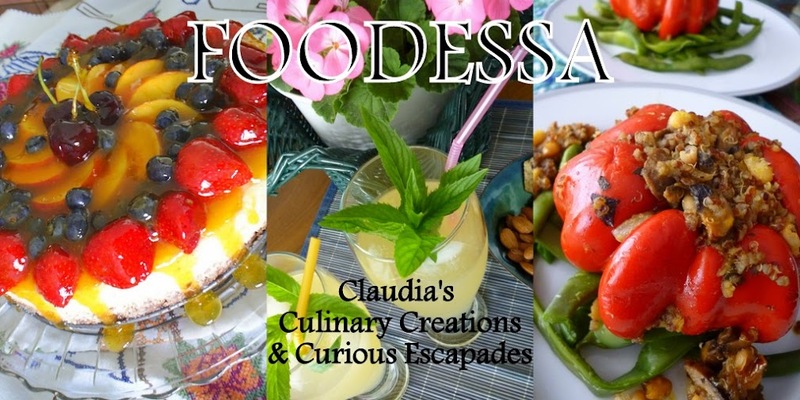 - a TROPICAL TASTY TALE. Are DRUGS in your PINEAPPLE? I'm speaking to the authorities. 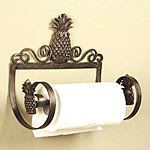 We have to check your pineapples miss. stashing drugs among grocery displays! You're kidding me right? Where's the candid camera." Wondering...what the heck I'm talking about??? this could have easily been a scenario in many retail outlets in the Netherlands. 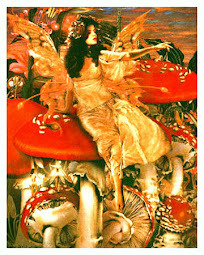 ..."First it was drugs among the flowers. 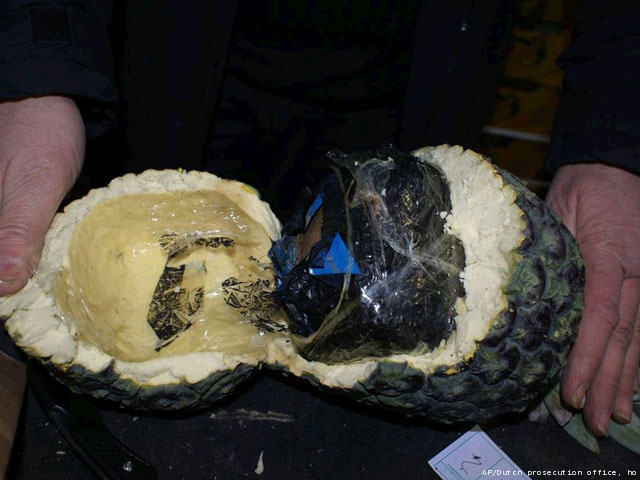 Now, drug traffickers have stuffed real drugs into fake fruit in an effort to smuggle cocaine into the Netherlands..."
..."Last month customs officials intercepted four kilograms (9 pounds) of cocaine hidden among 20,000 long-stem roses flown to the Netherlands from Colombia in time for Valentine's Day..."
..."police uncovered euro25 million ($34 million) worth of cocaine hidden plastic pineapples that were scattered among a shipment of real fruit! 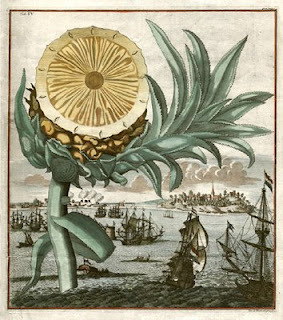 ..."The half-ton haul was intercepted when fruit packers unloading a consignment of pineapples saw some strange-looking fruit in the containers..."
I guess, desperation and greed has brought creativity to new heights! let's find out more about this tropical goodness. 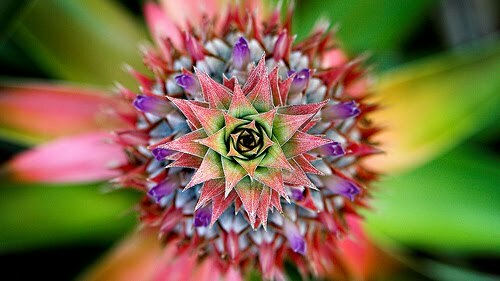 here’s the stunning evolution that a pineapple goes through. This is one of my very favourite tropical sweet treat. We are so fortunate to have plenty throughout the year. It’s rare not to find a beautiful looking pineapple on my kitchen counter. just, the fragrance puts a smile on my tummy. I do mostly prefer to eat it fresh. At times, I also enjoy it integrated into baked desserts. 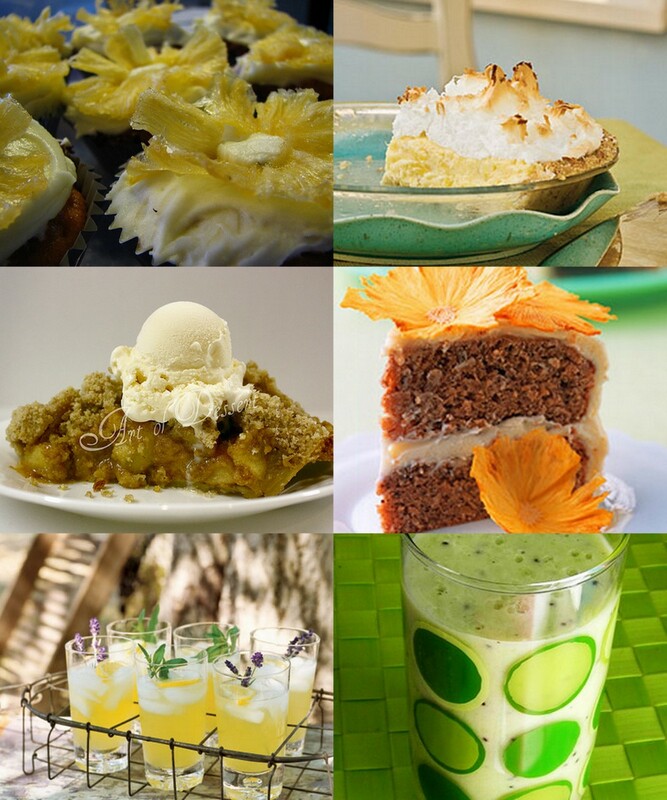 Especially, when I have a chance to make my 'Pineapple Spice cake torte'. pineapple fruit carvings and sculpting.
" Did you know that a " mature pineapple is actually a conglomeration of up to 200 little fruits that spiral around and bond to the central core. 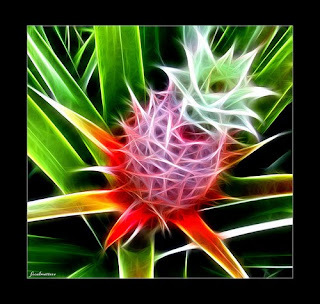 The individual fruits can be recognized in a pineapple's multiple thorny eyes." This here is...the ‘PINK’ pineapple. 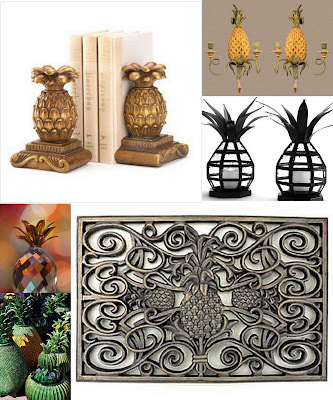 It is an ornamental species of pineapple from Brazil. Characterised by its pink inflorescence, its proper name is Ananas comosus var. ananassoides and while between 4-5 cm in length it sits upon a stalk which can be up to 40cm tall. They are edible but because of their strong acidic taste they are rarely eaten." right amount of ‘tangyness’ and sweetness as I enjoy every bite.
. After the popular banana...pineapple is in very close second place. Mango is not too far behind.
. Pineapple is the third most canned fruit only behind apple and peaches.
. Pineapples have wonderful tenderising enzymes and goes especially well with pork, meat, poultry and seafood dishes. It is also widely used in confectionery and puddings, juices and cocktails.
. Keep in mind that this same enzyme is detrimental to gelatine or dairy based dishes. To avoid this problem...either cook the pineapple ahead of time or just simply use canned pineapple which has already been heated to a high enough temperature to deactivate the pineapple.
. Other than what was just mentioned...pineapple does hold up very well during cooking and pairs well with both savoury and sweet foods. 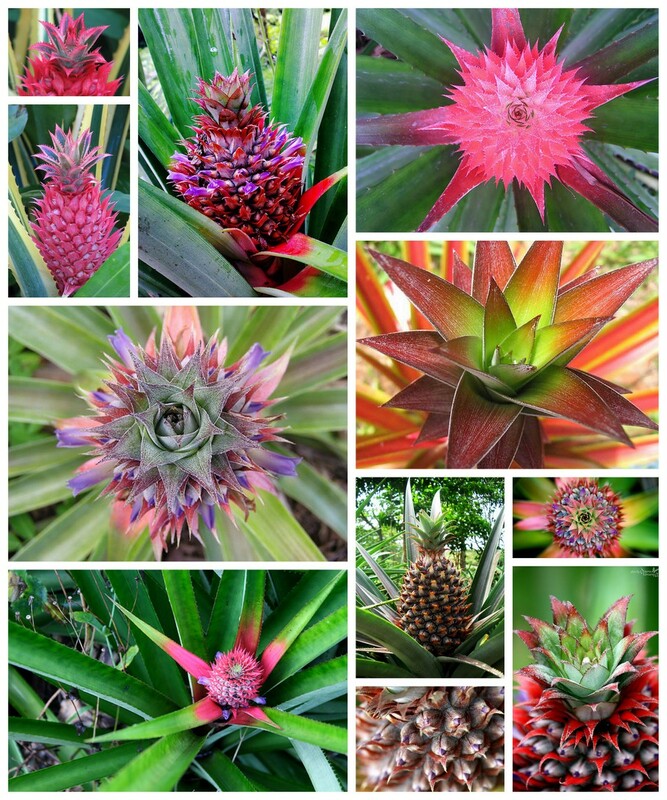 How to choose the best pineapple.
. Heavy with a yellowish tint that yield to a gentle pressure.
. The leaves should be green and firm.
. The base of the fruit should have a pleasant fragrant smell.
. 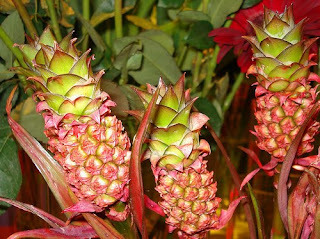 The area closer to the base of the fruit has more sugar content and therefore a sweeter taste and more tender texture. Pineapples have been used to alleviate body heat and fevers and used externally to dissolve warts, calluses and painful corns. It is also a good source of manganese, very good in the B vitamin and especially a great source of vitamin C. Due to the large amounts of natural acids and brome lain enzyme, large amounts of fresh pineapple should not be consumed as a main dish. On the other hand, it is these same juices in moderate amounts that greatly aid digestion as they closely resemble natural gastric juices. 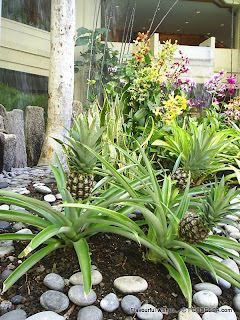 Pineapple is also a natural diuretic and its fibre aids in elimination of wastes. It also helps clear mucous from bronchial tissues. 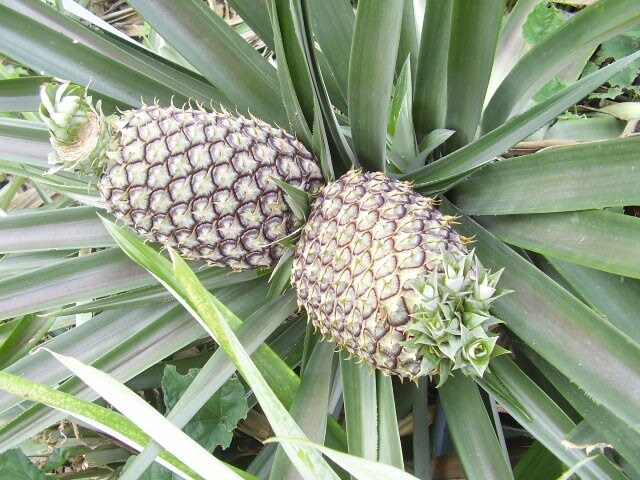 Unripe pineapple is not only inedible, it is poisonous, causing throat irritation and severe intestinal problems. 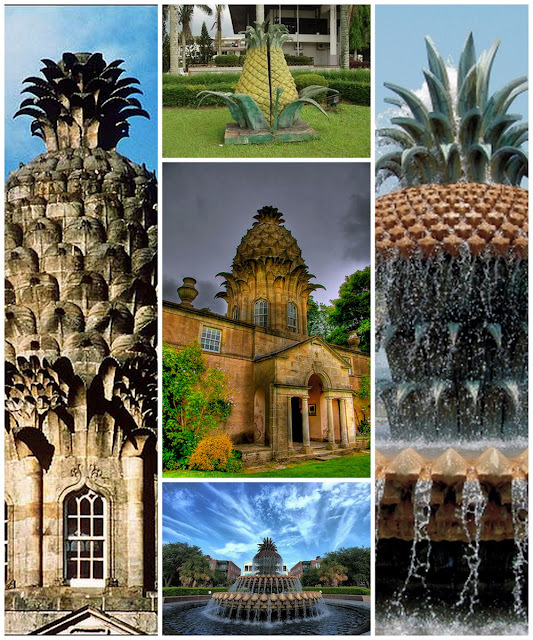 Christopher Columbus called it itpiña de Indes meaning "pine of the Indians."
. 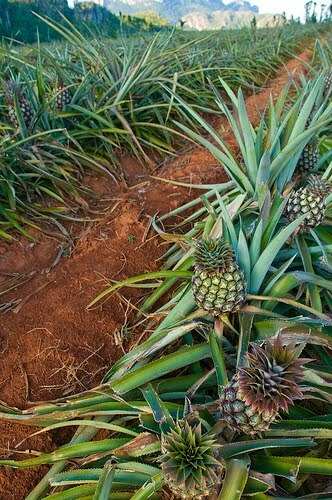 Although thought to have originated in South America, pineapples were first discovered by Europeans in 1493 on the Caribbean island that came to be known as Guadaloupe.
. The South American Guarani Indians first cultivated pineapples for food that they called nanã, meaning "exquisite or excellent fruit."
. 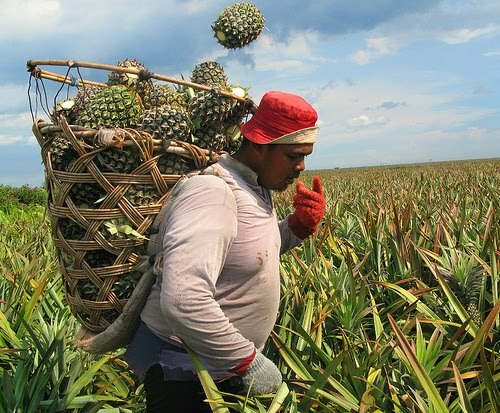 Another explorer, Magellan, is credited with finding pineapples in Brazil in 1519, and by 1555, the luscious fruit was being exported with gusto to England. It soon went to India and Asia.
. In 1751 George Washington tasted his first pineapple in Barbados and declared it his favourite tropical fruit. 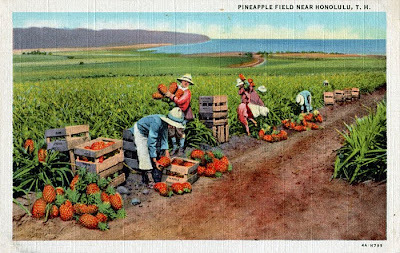 Although the pineapple thrived in Florida, it was still a rarity for most Americans.
. Captain James Cook later introduced the pineapple to Hawaii in about 1770 but commercial cultivation did not begin until the 1880s when steamships made transporting the perishable fruit viable. pineapple became Hawaii's largest crop and industry.
. As of 2001, Southeast Asia (Thailand and the Philippines) dominated the world production of Pineapples. In the Americas, Brazil came close behind as well as Costa Rica as a smaller producer.
. Other pineapple producing countries include Mexico, Honduras, Dominican Republic and China.
. Twelve countries absorb 90 % of the world demand of fresh pineapple. The US leads the demand and France, Japan, Belgium, Italy, Germany, Canada, Spain, England, Korea, Netherlands and Singapore share the rest of the supply. Or, in this case... where 'Hubby' and I vacationed in Honolulu, Hawaii at the Hilton Hotel. Here, its hotel lobby showcased miniature pineapple plants! Standing 16.7 metres tall the big pineapple acts as a tourist magnet, causing cars to veer off the tar and past a small pineapple patch towards the big one, not really knowing what to expect. 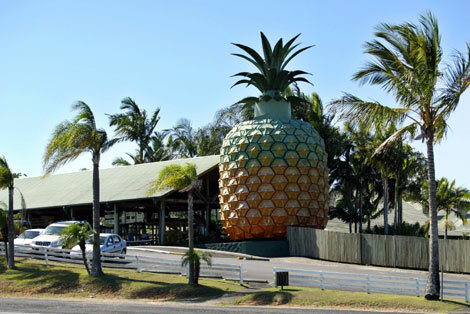 It turns out that this pineapple that was completed in 1991 is actually a shop, display room and viewing platform in one. 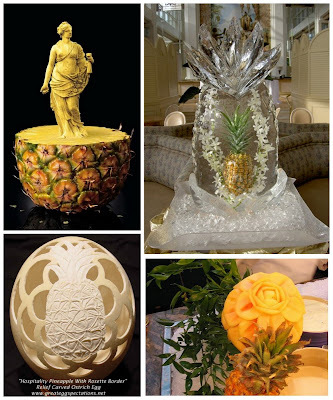 The pineapple is built from fibreglass, with a steel frame. It has three floors inside. 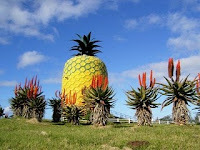 The lower level is a store selling pineapple paraphernalia, while the second level has an exhibition on the history of South Africa’s pineapple industry. 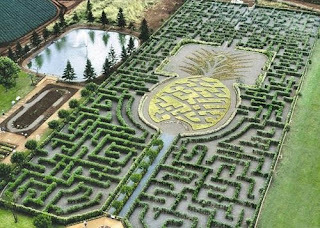 The third level has exhibitions on local industries with stairs leading to a viewing deck around the pineapple’s green “crown”. 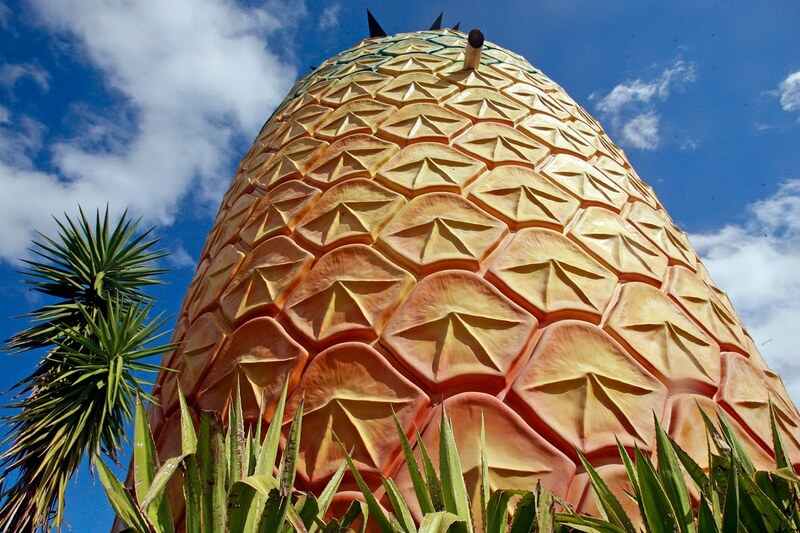 Oh, and did you know it is modeled on a similar big pineapple in Nambour, in Queensland Australia - but built 0.7 metres higher?
. The Pineapple in Dunmore, Scotland. As you can witness from the photos...the architecture is magnificent. that very few would have even seen one, let alone had the chance to taste one. 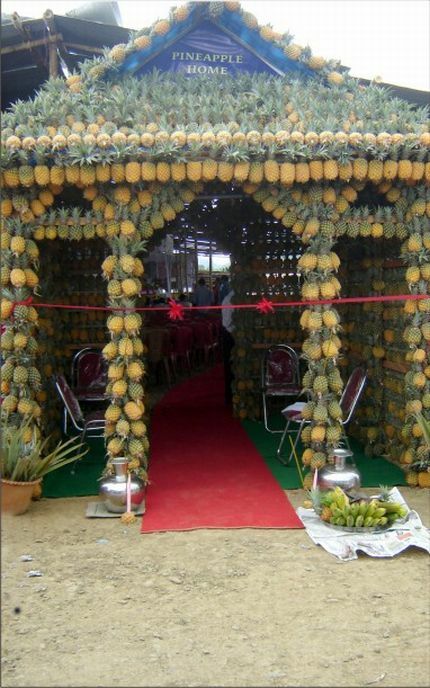 Here is a pineapple decorated stall representing the Pineapple Festival at Manipur, North East, India. It has so far drawn in over 500 cultivators. 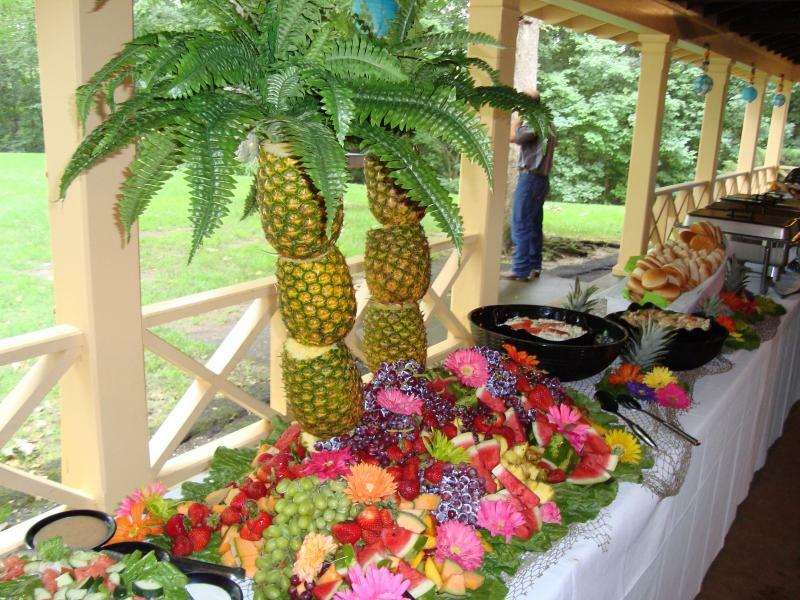 Quite a colourful event which provides great opportunities for the farmers to promote their pineapple business. Once again...it's been amazing putting this feature piece together. Hopefully, you have enjoyed it as much as I have. 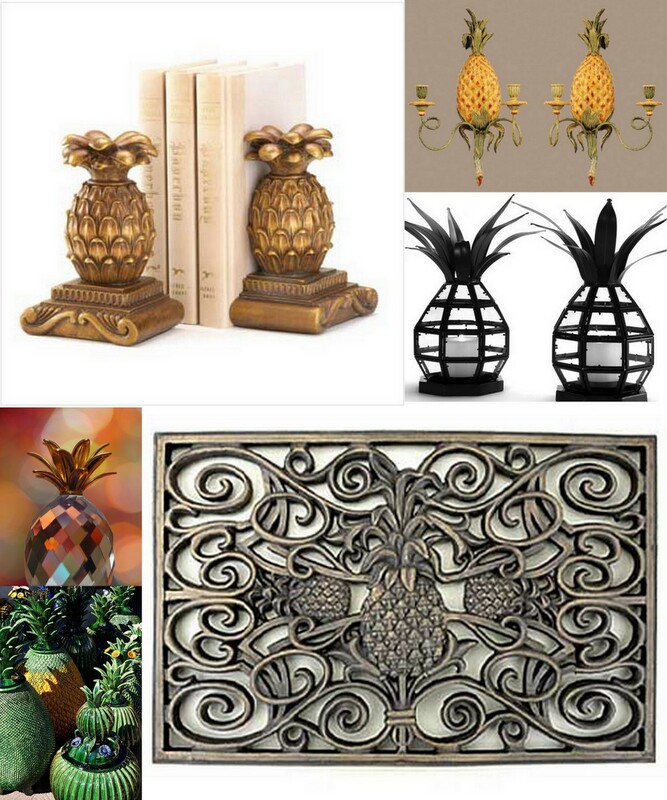 Did you realize how fascinating the PINEAPPLE was?